This tour only departs in the morning. We are comparing Palma de Mallorca Old Town Guided Bike Tour Prices from leading ticket suppliers and Try to find you Cheap tickets prices on the market. A guided bike tour of Palma de Mallorca’s Old Town that uncovers hidden sites and squares known only by the locals. A three hour excursion that explores the best of Mallorca’s sights, landmarks and architecture. The tour can be personalized around what you want to see, simply tell your guide what sights you’d like to visit and they’ll add it to the list! This is a great tour for those who want to view the Old Town from a different perspective and for those who enjoy cycling. It’s the perfect way to explore the Old Town as a first time visitor as you’ll be able to tick all the main sights off your itinerary. You’ll visit the Cathedral of Mallorca which sits on a cliff, the Royal Palace of La Almudaina which was originally built as an Arab fort and the café-district of Paseo del Born. The Old Town was once the commercial and economical capital of the island, today it’s a lot more laid back and is home to some of the best local restaurants on the island. The tour is both great exercise and an educational experience as your tour guide is armed with all the local knowledge and will divulge the Old Town’s history and best secrets. Perfect for families with older children. Ideal for firt time visitors to Palma. 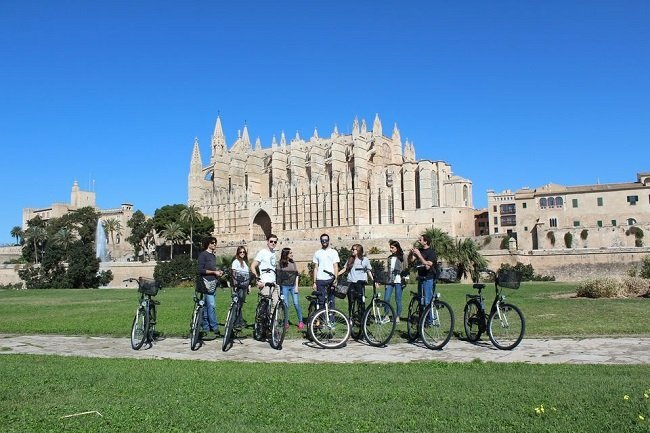 Your Experience With Palma de Mallorca Old Town Guided Bike Tour? The tour begins by meeting your tour guide at the cycle shop, finding the right bike for you, alighting and setting off cycling towards the Old Town. Once on route the tour will stop at all of the towns biggest and bet sights including the Cathedral of Mallorca, the City Walls, La Lonja and the Royal Palace of La Almudaina. Enjoy a leisurely cycle through the old town, soaking up the atmosphere as you go, stopping to take pictures at the local landmarks. You’ll uncover the cities nightlife, history and culture in just three hours! Cycle past the Banys Arabs, these ancient Arab baths give an insight into Palma de Mallorca’s Moorish history. Next you’ll cycle over to Palma City Hall, an impressive building housed near the Plaza Mayor. The square will be bustling with people enjoying their afternoon. You’ll cycle down the tree-lined Paseo del Born, enjoying the afternoon breeze as you go and stopping to peer into the luxury shops. What Palma de Mallorca Old Town Guided Bike Tour Includes? Royal Palace of La Almudaina. Make sure you're wearing suncream. Pack water to stay hydrated. Wear sports clothes to ensure a comforatble ride. Travelers Reviews about Palma de Mallorca Old Town Guided Bike Tour? The Palma de Mallorca Old Town Guided Bike Tour has earned over 204 reviews and a 4.5-star rating on Tripadvisor. We have a secure area to lock away your belongings if you've brought a bag. Please arrive atleast 15 minutes prior to the departure time. Meeting point: Carrer de Can Peuigdorfila, 5, 07001, Palma.